this is not not amiga forever related, but i can't find a (sub-)forum regarding c64 forever. so i ask here as 64 forever also comes from cloanto. by default c64 games are emulated matching original pale c64 colours. now i have seen youtube videos of c64 games showing colours with more saturation. is there an option to change that in c64 forever. i would only use the false colours in cases my sister visits again for playing retro games. because my sister likes these more colourful false colours more than the original pale ones. i prefer original colour scheme, of course. Don't know about C64 forever. But it's pretty easyto setup directly in WinVice. Video Settings -> VICII Colors -> tick "external palette" and select "Colodore" (browse the "C64 subfolder inside your Vice). The old default never showed the correct colors. This was always wrong from the beginning. Pepto recognized is some time back that he was wrong and created the more realistic "Colodore" palette. This is how a C64 looks like via TV or monitor. Check the screen comparison. right = old Pepto with more saturation. Still completely wrong. Last edited by Retro-Nerd; 22 February 2019 at 16:42.
it seems i'll have to install vice seperately as c64 forever doesn't let me configure vice. or does vice have some key like winuae (f12) for configuration? I have no clue. All this C64 Forever player looks confusing to me. To setup an additional menu for the existing one in WinVice. well, i'll have to mess with this another day. thanks to you i stumbled accross turbo outrun, which i now have to download and try first! Last edited by honx; 22 February 2019 at 17:10. It seems the Forever GUI doesn't have an option for changing the palette file. Would probably work via custom commandline ( Tools -> Option -> Emulation, scroll down to custom parameters). Anyway, it's easier to use the VICE subfolder inside your C64 Forever installation and start the x64.exe. as i never used a c64 emulator outside of c64 forever, how exactly do i load a game? is that command "load $, 8" correct? loads the disk directory by following the "LIST" command. Loads the first file on disk. Start via "RUN" command. Drag & Drop the D64 image (in windowed mode) usually works fine though. Only if you want to load a specific file from an disk image it makes sense to use the normal commands. 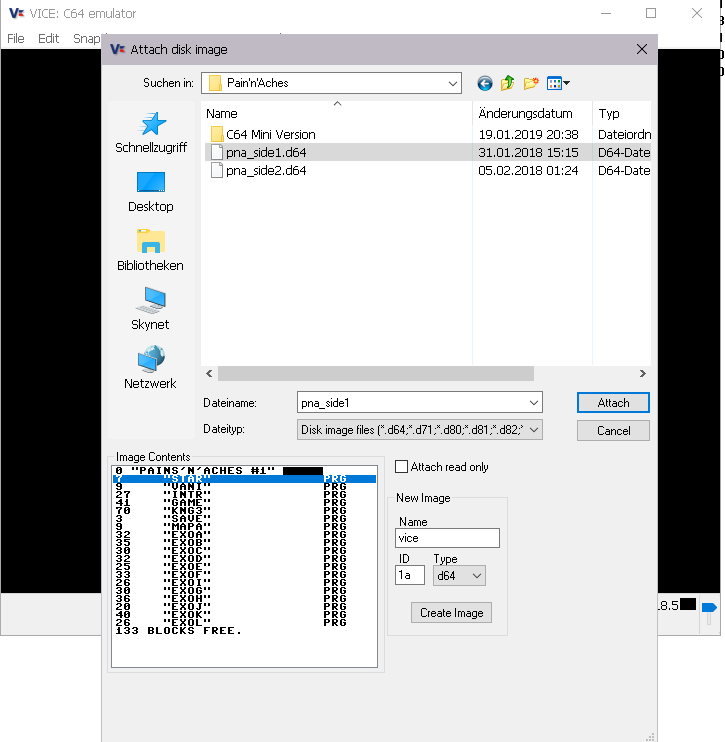 Another way to load a specific file is to select File -> Attach Disk Image and use the internal D64 directory browser to start a PRG file. Last edited by Retro-Nerd; 22 February 2019 at 17:48. Jeez, why are the C64 Forever colors purple? I had a C128D back in the day and don't recall the C64 mode being anything but shades of blue.